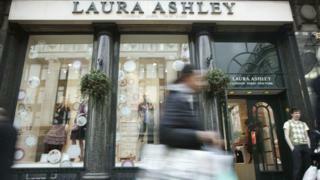 Investment firm Flacks Group says it is in the early stages of evaluating a bid for struggling retailer Laura Ashley. The Miami-based group said in a statement that it was in the "very preliminary" stages of considering a £20m bid for Laura Ashley. The statement comes despite the current owner's insistence it has no plans to sell the brand. Laura Ashley's shares fell 1.2% to 3.2p as the offer values the company at 2.75p a share. Earlier on Monday, Laura Ashley chairman Andrew Khoo said: "If and when an approach is made, the Board will discharge its duties as always and assess it on its relative merits." However, he went on to give a firm rebuff to any potential investors: "I would however like to state for the record that as major shareholders of Laura Ashley, we have no intention of divesting our shareholding. "Whilst I understand why potential parties would think we are significantly undervalued, I have complete confidence that we will be able to grow profitably and in a sustainable manner so as to create long-term value for our shareholders. "We remain just as committed and passionate about this well-loved brand as when we first decided to invest in Laura Ashley over 20 years ago." Last week, Laura Ashley issued a profit warning, telling investors that its full-year results were set to be lower than forecast amid "difficult" trading conditions. The fashion and home furnishings retailer also said it made zero profit for the last six months of 2018 as sales fell 4.2%. Originally based in Wales, Laura Ashley grew from a small factory in Carno to become one of the world's leading clothing brands in the 1970s and 1980s.